Comes in a beautifully designed 6-panel DigiPak. Please specify if you would like a signed CD. Special messages from the artist also added as schedule permits. Includes unlimited streaming of Delicious via the free Bandcamp app, plus high-quality download in MP3, FLAC and more. 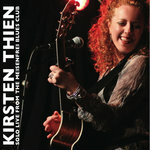 Kirsten Thien smolders with the electrifying guitar of Hubert Sumlin sparking.